Today, God, I go with you as we carry the cross. Help me to let you take my life as we walk the journey toward Golgotha, and trusting in you, let me plumb the depths of your light and love in my life. Amen. Then Pilate took Jesus and had him flogged. And the soldiers wove a crown of thorns and put it on his head, and they dressed him in a purple robe. They kept coming up to him, saying, Hail, King of the Jews! and striking him on the face. Pilate went out again and said to them, Look, I am bringing him out to you to let you know that I find no case against him. So Jesus came out, wearing the crown of thorns and the purple robe. Pilate said to them, Here is the man! When the chief priests and the police saw him, they shouted, Crucify him! Crucify him! Pilate said to them, Take him yourselves and crucify him; I find no case against him. The Jews answered him, We have a law, and according to that law he ought to die because he has claimed to be the Son of God. Now when Pilate heard this, he was more afraid than ever. He entered his headquarters again and asked Jesus, Where are you from? But Jesus gave him no answer. Pilate therefore said to him, Do you refuse to speak to me? Do you not know that I have power to release you, and power to crucify you? Jesus answered him, You would have no power over me unless it had been given you from above; therefore the one who handed me over to you is guilty of a greater sin. From then on Pilate tried to release him, but the Jews cried out, If you release this man, you are no friend of the emperor. Everyone who claims to be a king sets himself against the emperor. When Pilate heard these words, he brought Jesus outside and sat on the judge’s bench at a place called The Stone Pavement, or, in Hebrew, Gabbatha. Now it was the day of Preparation for the Passover; and it was about noon. He said to the Jews, Here is your King! They cried out, Away with him! Away with him! Crucify him! Pilate asked them, Shall I crucify your King? The chief priests answered, We have no king but the emperor. Then he handed him over to them to be crucified. So they took Jesus; and carrying the cross by himself, he went out to what is called The Place of the Skull, which in Hebrew is called Golgotha. There they crucified him, and with him, two others, one on either side, with Jesus between them. Pilate also had an inscription written and put on the cross. It read, Jesus of Nazareth, the King of the Jews. Many of the Jews read this inscription, because the place where Jesus was crucified was near the city; and it was written in Hebrew, in Latin, and in Greek. Then the chief priests of the Jews said to Pilate, Do not write, “The King of the Jews,” but, “This man said, I am King of the Jews. Pilate answered, What I have written I have written. When the soldiers had crucified Jesus, they took his clothes and divided them into four parts, one of each soldier. They also took his tunic; now the tunic was seamless, woven in one piece from the top. So they said to one another, Let us not tear it, but cast lots for it to see who will get it. This was to fulfill what the scripture says, They divided my clothes among themselves, and for my clothing they cast lots. And that is what the soldiers did. Meanwhile, standing near the cross of Jesus were his mother, and his mother’s sister, Mary, the wife of Clopas, and Mary Magdalene. When Jesus saw his mother and the disciple whom he loved standing beside her, he said to his mother, Woman, here is your son. Then he said to the disciple, Here is your mother. And from that hour the disciple took her into his own home. After this, when Jesus knew that all was now finished, he said (in order to fulfill the scripture), I am thirsty. A jar full of sour wine was standing there. So they put a sponge full of the wine on a branch of hyssop and held it to his mouth. When Jesus had received the wine, he said, It is finished. Then he bowed his head and gave up his spirit. Since it was the day of Preparation, the Jews did not want the bodies left on the cross during the sabbath, especially because that sabbath was a day of great solemnity. So they asked Pilate to have the legs of the crucified men broken and the bodies removed. Then the soldiers came and broke the legs of the first and of the other who had been crucified with him. But when they came to Jesus and saw that he was already dead, they did not break his legs. Instead, one of the soldiers pierced his side with a spear, and at once blood and water came out. (He who saw this has testified so that you also may believe. His testimony is true, and he knows that he tells the truth.) These things occurred so that the scripture might be fulfilled, None of his bones shall be broken. And, again, another passage of scripture says, They will look on the one whom they have pierced. Every Sunday, I do the same thing just before services: I take all the bulletins and papers out of my Prayer Book so that they don’t fall onto the floor as we pray. Episcopalians like tidiness in liturgy; it’s one of our hallmarks. Inevitably, there’s more paper than I recall putting there. A bulletin or two, a joke someone printed for me, and pretty often an editorial cartoon that someone clipped out of the paper. Some people realize priests need a good laugh from time to time. But one week not long ago I realized I was throwing away four funeral bulletins. In a simple weekly ritual, a mere fling of the wrist, four people were falling down into the trash with all the tissues, cough-drop wrappers, and everything else. Sometimes I would throw away one or two such bulletins, but four at once? It had been a long time since that had happened. I was stunned as I looked at the trash can: a beloved lady in her nineties, a card player extraordinaire who loved her family with all her might for close to a century; a bishop who had been on our staff and who had restored a sense of love and charity to a parish that desperately needed to need each other; a twenty-two-year-old man, a golfer with great promise, who died in a tragic accident no one could have prevented; and a young man who could make anyone laugh and whose life ended far too early just after his twentieth birthday. 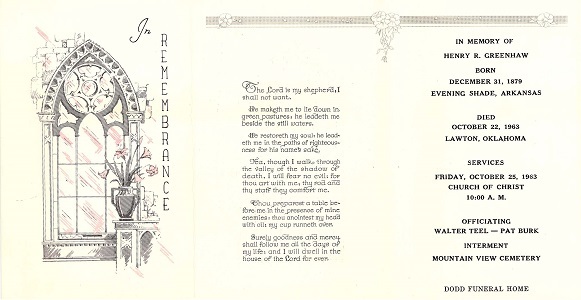 The deaths of all these people had so numbed me into my priestly stupor that I had merely reached into my Book of Common Prayer as if I were tossing away another Family Circus cartoon. I was grieving so deeply on the inside, and yet on the outside, I was so very pastoral that I couldn’t see my little ritual of book cleaning for what it really was: denial. Denying our cross is something we don’t often realize we are doing. We think we take it up and “follow him” with great regularity. But usually, we’re so busy following our own self-devised way, truth, and life that we miss the opportunity to walk with Jesus toward the real crosses of life. The chance to be Simon of Cyrene, the man who bent down and picked up Jesus’s cross, passes us by. Instead, we fashion our own sacred story at a comfortable distance. In our narrative, Jesus surely bears his cross and suffers, but he does so on stage with us comfortably seated in our cushioned chairs. Our plot is so full of denial, we watch as spectators, thinking we’re in charge. We perpetuate the myth that we can do the right thing, alleviate our pain and suffering, by watching the great drama, and after a great performance, reap our miraculous reward. In our denial of the true crucifixion we share with Jesus, we direct a new drama where our own power allows us to get the miracle, to get what we want, to be the way, truth, and life. Being in charge and reaching for the golden miracle is a mentality that pervades our souls. You’d think that those walking the way of the cross would be immune to such worldly pursuits, but instead, it seems that this pathway may be the most tempting place to try your hand at denial and usher in your own kingdom. When we face the death of a loved one, loss of a job, end of a marriage, or any other loss, the grief can be overwhelming. In the first stages, we enter into a deep denial and begin thinking that the difficulty will go away if we just have more faith, reach for the stars, and find the golden ring. We think that faith is a commodity, something that we acquire by hard work. For me, a fierce competitor, the idea of trusting in God’s faithfulness to me instead of my faith in God – that’s way out of control. Too vulnerable. Too dangerous. Too scary. Becoming vulnerable, actually letting the difficulty of the cross come my way and embracing it for what it truly is, no way. Every molecule within me just knows that I can lick the pain, the frustration, the very real and present danger. Sort of like running in a race, I think that I can push through the wall of pain and find a new breath on the other side all on my own – something I do, by myself, in my way, truth, and life. Most of the time, it seems to work. I can handle a death here and there. I can handle a little darkness. That stuff just comes with life and we learn early on how to let the Jesus drama take some of our pain. We sit, watch, listen, and think about how much more Jesus suffered, and knowing that, well, it seems to take our pain away. And when others face darkness, sure, I can help them reach for a brass ring. But when we face one loss after another, such as four funeral bulletins in the trashcan, the cracks in our way, truth, and life are exposed. When we face something like four people dying in just a few days, the bulletins in the trashcan are a wake-up call. Burying a dear and lovely lady who lived a long and graceful life is something any of us can do; despite the difficulty of the death, we know deep within that the life was good, long, fulfilling, and that the next life is there waiting. Even when a community’s past pastor dies after a long illness, we face the reality. Losing the pastor and friend is remarkably difficult, but the loss is not overwhelming to most of us. We’ve all said it: He’s better off, or, She’s suffering no more. At some level these statements are still a type of denial, a way of coping with death, keeping Jesus as a character on the stage. But when a string of deaths comes or two young men in their twenties die or any massive loss comes our personal way, the cross comes off the stage and lands directly at our feet. The work we do, reaching for the next brass ring, the next rung of faith, seems more intolerable than hopeful. Lives ended in their twenties, or the death of a parent, or the loss of a best friend. Crucifixion, agony, despair, torture all come to mind. Deaths out of nowhere, so unexpected, so unreal, so unbelievable, expose our denial and reveal the fallacy of our Jesus on stage. If we’ve been clinging to our own way, truth, and life, the darkness of deaths such as these plunges us onto a journey of the soul we don’t want. It’s as if we walk into a nightmare in living color. As each day passes, any clarity we had falls away as the nightmare blurs our life, as if someone were moving the lens of our eyes; exhaustion sets in. Before we know it, the colors have bled into each other and shades of gray and black begin to appear. Denial, which had been our close friend and served us well in the past, becomes anger as we realize we are not in control. A deep loss exposes us for what we are: idolaters. We’ve worshiped our way, our truth, and our life as we watched the drama of our control. And that is where the miracle occurs. At the moment we lose control, at the moment we give in and let go, Jesus cries forth from the cross, It is finished. For most of us, it’s the first time we really hear Jesus from the cross. It’s not that all has ended, that the darkness has become the norm. Instead, Christ’s final words on the cross usher in the greatest hope of light. For with the proclamation from him, healing has begun. When we let go of our conjured power and start letting God lead, guide, and direct, the nightmare of whatever we cannot bear is given to God. Death, divorce, despair, depression, a wayward child, a friend no longer talking to us. Whatever brings us to the foot of the cross brings the hope of healing, not of our own fashion but of God’s. And the possibility of light piercing our tomb becomes all the more possible. For when we realize we aren’t God, we know God will be faithful. We don’t have to climb another rung on the faith ladder. We don’t have to prove ourselves before God to get a brass ring. We don’t have to make straight A’s on the Heavenly report card. Instead, all we really have to do is realize it’s not our way, our truth, our life. And any time that happens, the miracle is possible. God is faithful. Resurrection comes when we let God be God. When life presents difficulties, we discover our powerlessness. At any time, the boundaries between the light and the dark can become harder to see. The cross we bear can plunge us into a place of darkness where the colors bleed into each other and grays and blacks appear all along the horizons. With this exercise, which is a two-step process also involving the next chapter, we begin to see our lives in the cross of Christ as we attempt to give ourselves over to the way, truth, and life. Black and white copies of all the previous exercises, made on a copy machine or by scanning and printing images on your computer and printer. Rubber cement or glue stick. Large poster board, preferably extra-heavy stock, or a large piece of foam core. Assemble all your original work around you. Let it create a sacred space for this exercise, icons into your life and God’s. After creating this holy space, arrange the black and white copies of your work on a table before you. Revisit each one, taking time to reflect upon the discoveries of each. Where did you find the dust in your life? How were you able to cleanse your temple? Have you been able to reclaim your life and the people in it as gifts because you have begun to accept the Lenten journey of our lives? Have you identified the crosses you bear and the people you’ve hurt along the way? As you reflect, begin to take the black and white copies and cut or tear from them images that really speak to you. Many images will be important, but if you’ve done the exercises throughout the book, you’ll be able to work quickly and readily identify the images most important to your journey. At first, just identify the images and place them before you. Don’t worry about arranging them. Once you’ve found all the images that grab your heart and soul, begin to arrange them rapidly, without thought. Don’t glue them onto the board at this point. If you like, you might arrange them in the shape of a cross; you can even cut the poster into the form of a cross if you like. It doesn’t have to have neat edges – it could be a torn and battered shape itself. As you work, you might ask yourself which of the images needs Christ’s light the most? Which of these parts of my life need to face the darkness of Jesus’s final hour, hear the words, It is finished, and then await the coming of Easter light? Play with the arrangement as you ask yourself these questions. When you feel as if you’ve exhausted the process, begin to glue the copies, overlapping the images, as you like. Try not to put them in rows or in neat arrangements. Let the chaos be a part of the creation itself and let the images form an expression of what crucifixion looks like in your life. When you’ve finished the cross, take time to sit with it and reflect for a while. Imagine that you are able to carry this cross with Jesus to Golgotha. Imagine that everything upon your cross is upon Jesus’s cross. Let your life be present with God as the darkness of the afternoon comes and as the final breaths flow form Jesus’s body. Hear him say, It is finished. Let go and let God. What was it like to revisit prior exercises? Did you see the earlier chapters in a new light? Has the journey helped expose more than you knew would come your way when you set out? What new things about your life did you discover? Were there common themes among the chapters? Common stories? Common people? Have you found yourself responding differently to memories as you’ve made the journey through this book? Why or why not? How have you seen yourself in the scripture readings and various stories on the journey? How has this been different for you? How might you continue to identify the things you need to take to Jesus upon the cross? What exercises have helped the most? How might you repeat them? Are there other spiritual disciplines that you need to make your continued journey with Christ? How might you incorporate them into daily living? Are there parts of your life you still cling to, unwilling to take to Christ? If so, why? And what do you have to lose it you open yourself up to God in new ways? How has this process allowed you to trust in God more? How have you begun to see the light in your life?